mportant when ordering a Pet-Paw Set because the two paws must fit together. If the claws are too long, I will "trim" them back in the wax stage. Aslo, make sure to leave at least a 1/2" margin all around the impression. Do not make the impression too close to the edge of the container. 1. Place your order below. 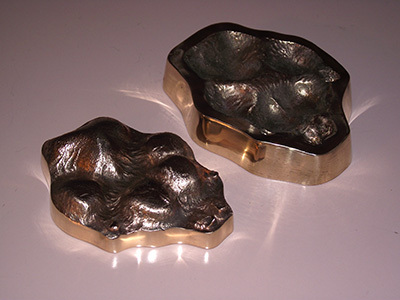 Don't forget to check out our "Foundry" page for more castings for sale. or make your own (see "Impression Process" page). Please see the "Impression Process" page before placing your order to learn how to make the "perfect" impression. Expect to receive your Pet-Paw approximately 6-8 weeks after we receive your impression. Multiple paw orders can take longer. Orders cannot be rushed. Original impressions, playdough, and containers will be returned upon request - additional postage may be required. Scroll down to the end of this page to buy additional postage if you would like to receive your origninal impressions back. Additional postage is not necessary if you ordered a small Pet-Paw and your impression kit will fit into a small flat rate Priority mail box because both items will fit in this size box. Custom Pet-Paws: do you want a heart around your paw, or do you want your small cat paw in a circle shape? I can make custom paw shapes, just ask! Do you have a plaster or clay impression? 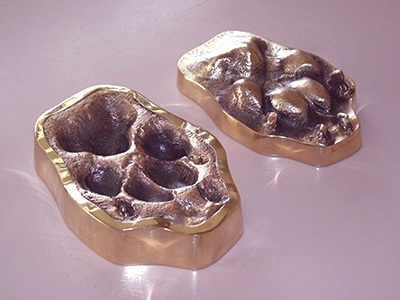 I can make a Pet-Paw from your existing plaster cast or hardened clay impression. I will need to spray the impression/cast with shellac and there may be some discoloration. 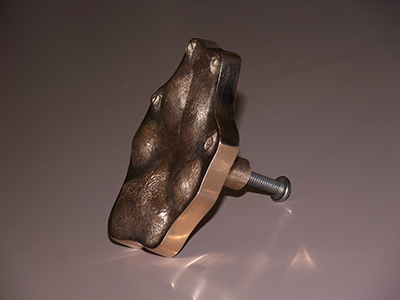 See the "Impression Process" page for more information. QUESTIONS? Feel free to call me or email: Tracy 509-553-3842 tracy@starsunmoon.com, or visit our frequently asked questions page. Please make sure you check your email for messages about your Pet-Paw. If we send you an email, it will be from tracy@starsunmoon.com - don't let our important messages go to your junk email folder! Remember....your Pet-Paw is only as good as your impression! Make a good impression and please don't make it too deep. This is especially important when ordering a Pet-Paw Set because the two paws must fit together. If the claws are too long, I will "trim" them back in the wax stage. This delightful little Pet-Paw is created from paws up to 2" in length. 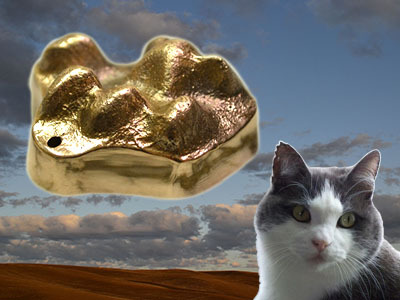 It is cast in solid metal directly from your small dog or cat's paw impression. The small Pet-Paw is offered in relief style as shown. 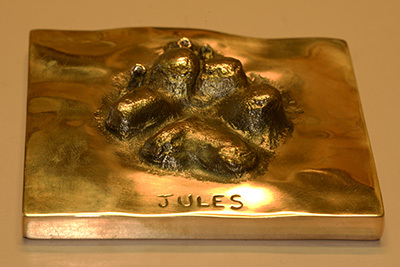 Imprint style is available in the small Pet-Paw Set below. Now available in .999 fine Silver! $249 to $349 (prices may change as current silver prices change). Call 509-553-3842 to order. The large Pet-Paw is over 2" in length and weighs 1 lb. on average. 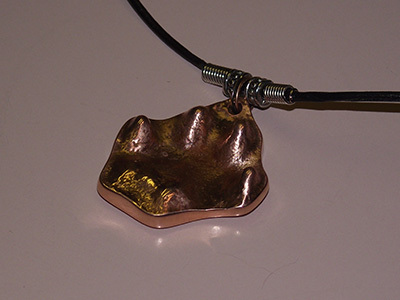 It is cast in solid metal directly from your dog's paw impression. The large Pet-Paw is offered in relief style as shown. Imprint style is available in the large Pet-Paw Set below. This Pet-Paw is made from the BIG dogs! 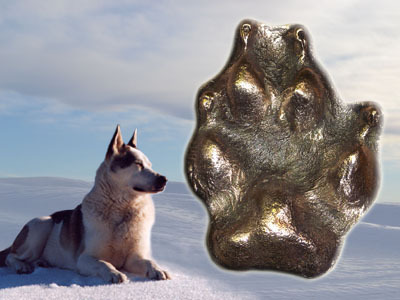 The Giant Pet-Paw is over 4-1/4" in length and weighs 2 lbs. on average. 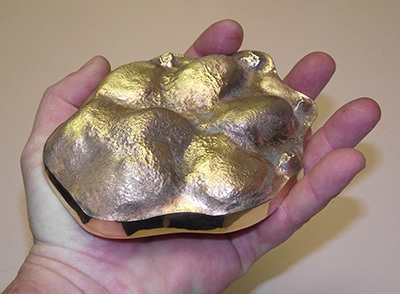 It is cast in solid metal directly from your dog's paw impression. The large Pet-Paw is offered in relief style as shown. Not available in copper. Two small Pet-Paws up to 2" in length fit together as a set. One is relief style (left) and the other is imprint (right) style. Paws will fit together. Paws are made from one impression. When making the paw impression for this order, please make a fairly shallow impression, not more than 1/2" deep. Not available in copper. 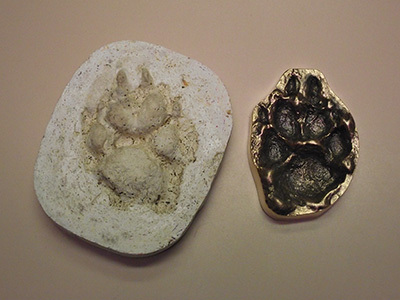 Two large Pet-Paws in both imprint (left) and relief (right) styles. Paws will fit together. Paws are made from one impression. When making the paw impression for this order, please make a fairly shallow impression, not more than 1/2" deep. Not available in copper. Outfit your kitchen cabinets with unique Pet-Paw cabinet knobs made from your small dog or cat paw impression. Call for a quote (price break) on multiple knobs for your whole kitchen. Keep your pet's paw close to your heart. 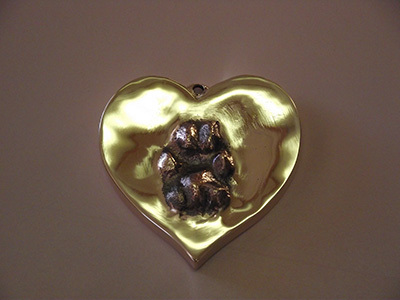 The Pet-Paw pendant is cast from your small dog or cat's paw impression. Can also be nose impression. Pendant is very thin and light weight. Available in relief style only, as shown. Chain/cord not included. How cute is this? 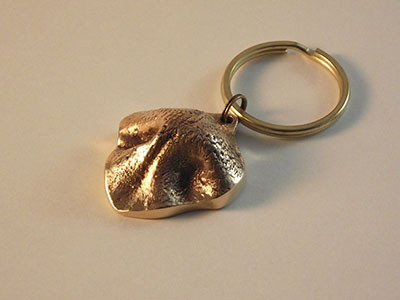 Send us an impression of your dog or cat's nose, or paw under 2", and we'll make it into a key chain! Comes with key a ring. Your pet's paw in a tile! This is a nice thick bronze tile with typical tile demensions of 4-1/4 x 4-1/4. 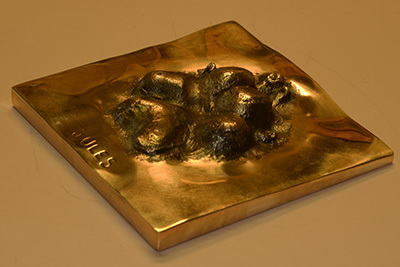 Made only in bronze. Inscription is optional. 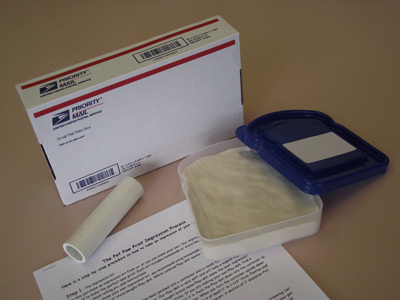 Our impression kit contains soft playdough for ultimate accuracy ready to go in a sealed container, a small rolling pin, and detailed instructions. This impression kit is good for a large Pet-Paw, small Pet-Paw, or either of the Pet-Paw sets above. Impression kits are sent via U.S. Priority Mail. They cannot be shipped overnight. Impression Returns within the U.S.
Would you like to have your play-doh or clay impression returned? If so, additional postage is required. Just click the button on the right to add an additional $7.00 shipping to your order within the United States. Your Pet-Paws and your impression will be shipped to you in a medium size Flat Rate US Priority mail box. Impression Returns in Canada and Outside of the U.S. If you are placing an order from Canada, or a country outside of the United States, and you would like to have your play-doh or clay impression returned to you, additional postage is required. Just click the button on the right to add an additional $20.00 shipping to your order. Your Pet-Paws and your impression will be shipped to you in a medium size Flat Rate US Priority mail box.